It's more than official - Mezco has a hit on their hands with Family Guy. The first three waves of figures have sold well, a fourth is hitting soon, and the Peter vs Chicken playset is genius. More on that later this week at MPS. The latest release is the first of their large quarter scale figures. 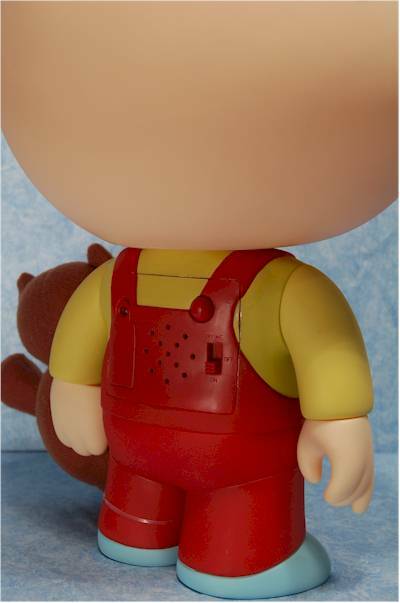 Since it's Stewie, he isn't actually 18" tall - that would make Peter huge, who is the second release - but he's still mighty big. 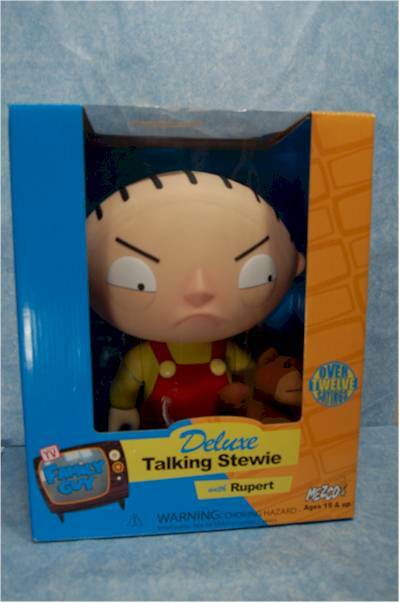 He comes with Rupert, and the icing on the cake is that he speaks over 12 sayings. Or so the box says. I picked him up at Media Play last week, and you should be able to find him at most of the Musicland family of stores at this point. He ain't cheap at almost forty bucks, but he's still mighty cool. Big box, basic colors, access to press his button. The colors follow the standard, and what was somewhat dull on a 7" figure is downright boring for one this large. Still, it's sturdy, and it does proclaim "Over 12 Sayings!". 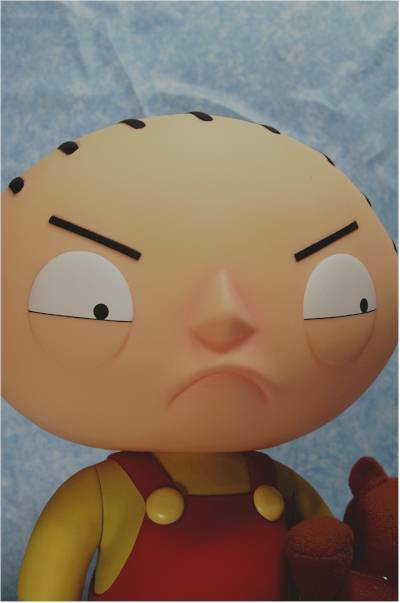 Now I'm pretty sure this figure is nothing more, sculpt-wise, than a blow up of the Stewie from series 1. And yet I gave that sculpt only **, while this one gets ***. What happened in between? Actually, the problems I had at the smaller scale seem less of an issue at this size. I'm not sure why, since that's not normally the case - usually, as the figure gets bigger, the issues become more obvious to the eye. But not this time. The oddly shaped head seems closer to the show, and while I'm still not thrilled with the frown, it works pretty well with this particular position of the eyebrows and eyes. The expression also works well with the majority of the sayings that he spouts when you push the button. He still does have the neck issue, that I detailed in the review of series 1. Unlike the cartoon, where his chin drops down below his body, in 3D it must stay above, and that throws off his appearance slightly. Stewie stands about 12" tall - just under it - and will be a tad big next to Peter. But from what I saw of the two together at SDCC, it will still work just fine. No issues major issues here. When dealing with such a large figure and so few colors, consistency in each color itself is the most important thing. The red stays red across his body, with no lighter or darker areas, or weird changes in texture or finish. Likewise with the yellow of his shirt and his skin tone. The few details are clean and neat, and overall the paint ops are solid. 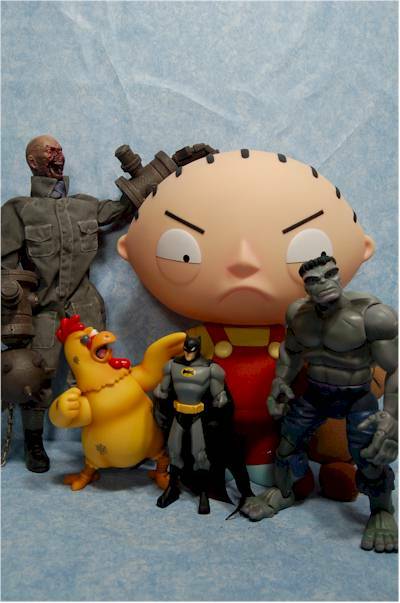 Stewie isn't meant to be super poseable, but he still has a few joints. There's his neck, shoulders, top of his legs, waist and wrists. Like I said, not a lot, but it's more than the small version of Stewie had, and just about as much as you could possible get into a character design like this. A ball jointed neck would be the only thing that could boost the score much more. 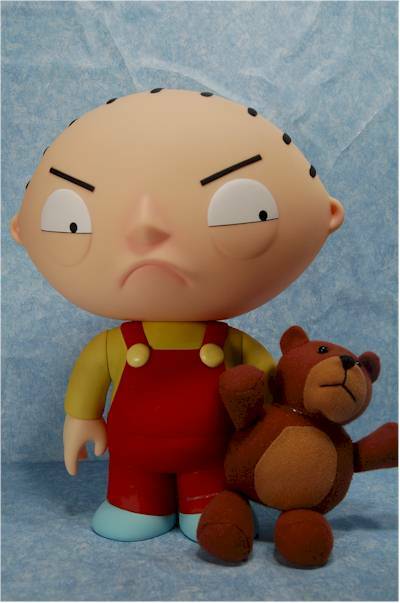 Stewie comes with his faithful bear, Rupert. There are no hidden weapons in Rupert, which is a good thing since at this scale you'd end up detained at the airport for a very long time if you tried taking this toy on board. 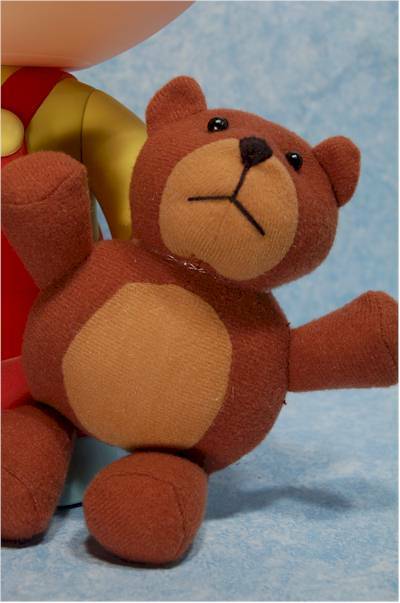 Rupert is a plush bear, just like he should be, although the plushiness throws off his appearance slightly. Stewie can't actually hold him either, which is too bad, but he comes with a couple rubber bands to keep him close. - "Oh, I'm going to crap double for you tonight!" - "When the world is mine, your death will be quick and painless." - "I say, am I to spend the entire day wallowing around in my own feces!" - "You must continue to sanitize my crevasse and be damn grateful for the opportunity!" - "Why don't you burn in hell!" - "Hmmm, the ruptured capillaries in your nose belie the clarity of your wisdom." - "Oh Mother, I come bearing a gift. I'll give you a hint - it's in my diaper, and it's not a toaster." - "Oh, blast, you and your estrogenically treachery!" - "What the hell do you think you're doing?" - "Evidently madam, you and I differ greatly in our conception of beauty." - "I offer you the opportunity to join me in glorious battle." - "Gah - there I've gone and soiled myself. Are you happy now!" - "Oh, that is a vile and odious lie!" Since that's 13, I'm betting that's it. Sort of a baker's dozen of humorous quotes! They are all good quotes, although I'm sure every fan will be able to spout at least 12 more that are equally as good. The speaker is actually on his back, facing out, so hearing him from the front is a little difficult. He could use a little more volume, but the button is easy to get to, and you can turn him off easy enough if your kids (or co-workers) start to drive you nuts. Most kids who would actually play with this probably shouldn't be watching the show. But he's still very fun, and I'm betting that if you take him in to work - which is my plan - folks won't be able to ignore his presence. Stewie is pushing the price boundary at close to $40. That's some serious cash for a 12" figure, even if he does talk. He's cool to have, but you'll need to think about this particular category more than usual in this case, since how willing you are to part with that kind of green can be a very personal situation. Dead batteries. Be sure to push the button and check him out at the store, just in case the pimple faced stock boy has spent most of last night making him talk. The paint is great, the articulation much improved, and the sculpt is growing on me. Throw in over a dozen sayings, and you have one very cool figure. The price hurts, and your wallet will feel the pain more than you. However, if you are strongly considering buying the 18" Peter, you might want to pick this up for sure. They'll make a great looking pair on the shelf! - Amazing Toyz has him for just $37. - CornerStoreComics has him for $38. - Killer Toys has him for $45. - and both Yikes and Alter Ego should have him in sometime next week! I couldn't find it listed on their site yet though. - here's my reviews of series 1, series 2, series 3, and the Peter/Lois two pack.